The hill derives its name from a cairn at the summit. Ériu is a sovereignty goddess embodying Ireland. Éire is the Modern Irish form of this name. 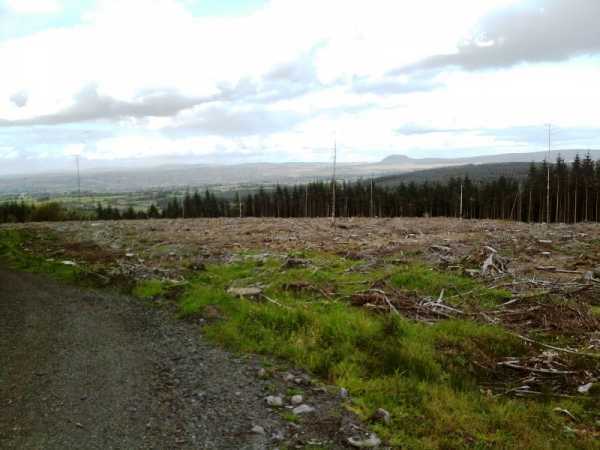 See Arderin in Slieve Bloom, which has a similar origin. Unfortunately, the cairn is overgrown and the formerly excellent view of Lough Neagh has been totally blocked by newly planted conifers. Tobernaveen Hill is a slightly lower hill to the west. Carnearny is recorded in the Annals of the Four Masters as the site of a battle in 912 AD where the local chieftain Loingsech Ua Lethlobhair (Lawlor) was defeated by Niall, son of Aedh Finnliath of Tyrone [LNP]. Carnearny is the 1108th highest place in Ireland. Carnearny is the most southerly summit in the Antrim Hills area.